Ricardo is the only UK consultancy with the capability to provide a fully integrated, in-house, UKAS accredited odour analysis service with a complete range of process, environmental and energy management expertise. 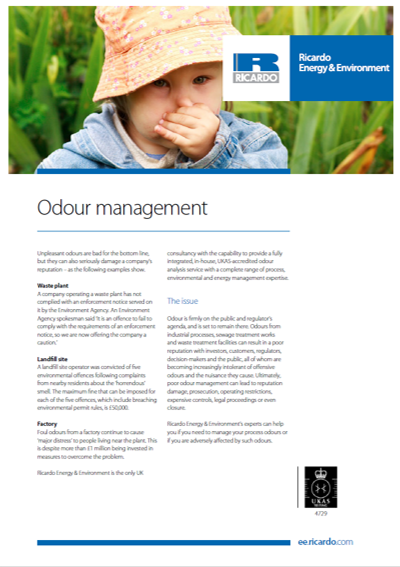 We can help you if your processes are creating an odour or if you are adversely affected by such odours. 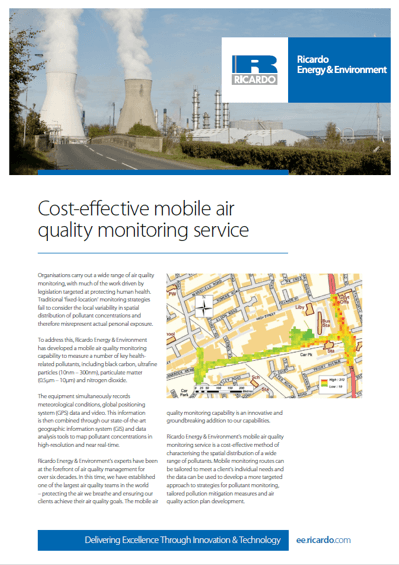 We can provide you with robust, independent and expert odour assessment, measurement and management services to support you in demonstrating odour management compliance to your local community, your customers and your regulators. Preparation of bespoke odour management, mitigation and abatement strategies including the design and implementation of pilot-plant trials for odour and pollution abatement. Impact assessment and modelling to establish the controls required for new and existing facilities. This includes independent off-site odour surveying that complies with the Environment Agency’s additional guidance for H4 Odour Management. 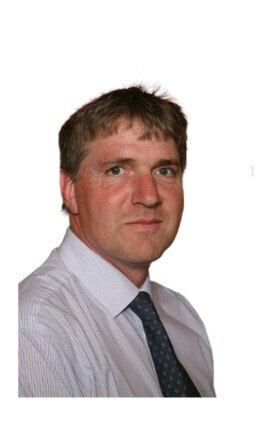 This can be particularly important in support of planning and permit applications for new or substantially changed processes. Bespoke environmental monitoring programmes to chemically analyse trace odorous species. This can be particularly beneficial for processes that release known chemical compounds. In-house odour sampling and UKAS accredited analysis services (UKAS reference 4729). This is carried out in accordance with British Standard BS EN13725:2003. Odour sampling from stacks and diffuse sources such as tanks and lagoons. Performance testing of impact abatement equipment. Hedonic-tone analysis to appropriate European standards (this provides an indication of the likely offensiveness of odours). Review of third-party odour studies. Support in regulatory or community liaison negotiations.